we went up to the opposite end of Komachi-dori Street. 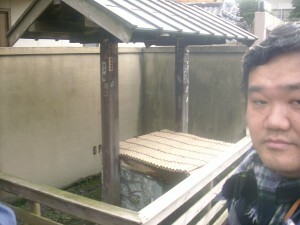 At the end of the street, there is a very old well with a roof called “Kurogane no I” (鉄ノ井、a well of iron), which is one of the “Kamakura Jyuu Sei”(/鎌倉十井、 The Ten Great Wells of Kamakura ). According to a legend, once upon a time people found a head of an iron Kannon(a Buddhist Deity of Mercy) statue which was about 1.5m tall in this well, and that is why such a name has been given to this well. Actually the quality of the water of this well is very good. 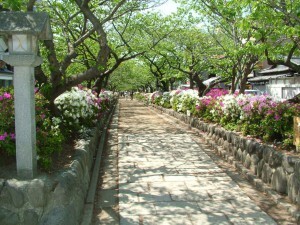 The end of Komachi-dori Street faces the road in front of the front entrance of the Tsurugaoka Hachimangu Shrine http://www.hachimangu.or.jp/index2.html that I referred to in Part1. Along the road there were some houses and stores most of which had a special amulet of “Shimenawa”（/注連縄, a sacred rice-straw rope talisman ） on the front entrance. 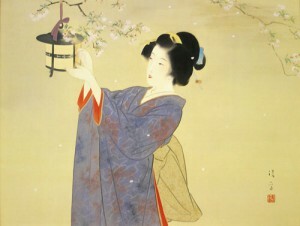 In Shintoism a shimenawa is believed to have a special power to protect the house from profane things or evil. Usually a shimenawa has “Shide”(/紙垂, a papercraft which has a specific shape depending denominations to represent holy power or a sanctuary). 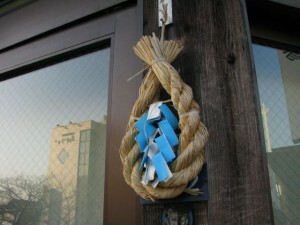 And usually a shide is white, but in Kamakura area there are a lot of shides that are blue,which is unusual. Dave-san ,who had seen a lot of white shides,took interest in such “blue shides” and took their pictures. We , then, moved to the front entrance of the Tsurugaoka Hachimanguand I filled the two friends in on basic information on the shrine. 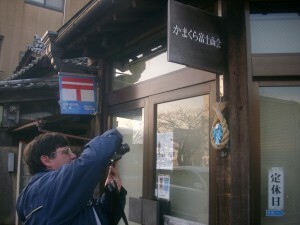 And we went to a nearby Japanese soba restaurant “Minemoto”（/峰本）http://www5a.biglobe.ne.jp/~minemoto/ as planned. I had sometimes dropped in on this prestagious soba restaurant chain and had liked the food and the atmosphere, so I chose this restaurant. 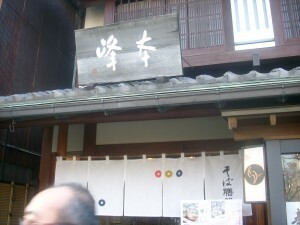 Actually there are many soba( Japanese buckwheat noodle) or udon( Japanese wheat noodle) restaurants in Kamakura especially along Komachi-dori. 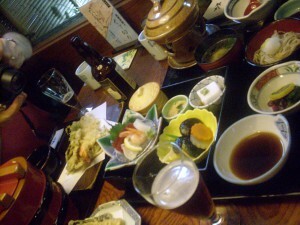 The restaurant serves not just soba and udon but various Japanese food, such as sushi and tempura, and others. 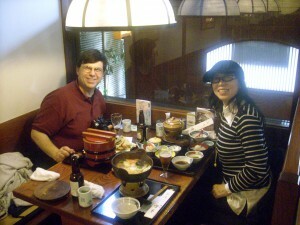 we enjoyed these food of course menu including udon,tempura, sashimi(raw fish), and other stuff. All of them were quite delicious and every one of us was satisfied. 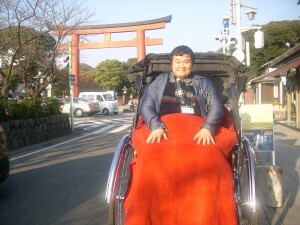 After having lunch with contentment, we went back to the front entrance area of the Tsurugaoka Hachimangu to hire rickshaws, for one rickshaw company always keep some rickshaws and their pullers at some spots and this was one of them. To tell the truth, before we had lunch, we had already spoken to a rickshaw-puller and told him we would like to hire two rickshaws. So, it was easy to hire them soon after lunch. 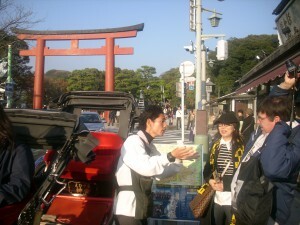 Thus we hired two rickshaws at “San no Torii” (/三の鳥居, The Third Torii )gate which stands at the front entrance of the Tsurugaoka Hachimangu. There is a big and long approach, which is 1.8km(a bit longer than 1 mile) long, to the shrine called “Wakamiya Ooji” whose entrance is near Yuigahama Beach. The approach was built by Yoritomo Minamoto(/源頼朝, Minamoto no Yoritomo), the first shogun of the Kamakura Shogunate in 1182. At the entrance of the approach there stands “Ichi no Torii”(一の鳥居, The First Torii)gate, and at the middle of the approach near Kamakura station area, there stands “Ni noTorii”（二の鳥居, The Second Torii）gate. On the approach from Ni no Torii and San no Torii, there is a special heaped path called “Dankazura”(/段蔓) which is an avenue of cherry trees, having other flowers made for Masako Houjou(/北条政子) who was the wife of Yoritomo, for she was pregnant at that time. The visitors to the shrine in ancient days were supposed to pass through the three Torii gate to get closer step by step to enter the shrine. Usually a shrine has a torii gate at its entrance to represent the border and entrance of the sanctuary, but some large shrines have more than one torii gate so that they can protect the holy area with multi shields. By the way, “torii” ‘s Chinese characters ”鳥居” has a special meaning, for “鳥”　means “bird” and ” 居　” means “　stay” or ” reside”. So, 鳥居　means “perch” . This is because the primary reason of existence of a torii is a landmark of a shrine. In the idea of Shintoism, a shrine is a place for a deity or its familiar spirit to come and stay so that we human beings can contact them. In order to realize that purpose, human beings need to build a shrine and make it distinct so that it can be recognized by deities in sky-high heaven. 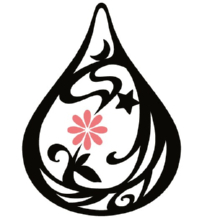 In addition, usually a deity or its familiar spirit takes an incarnation of a bird to fly down to the earth, so, people make a outstanding “perch” with bright shiny color of red which could work as a good landmark for that kind of “bird” to dive at and to stay at. 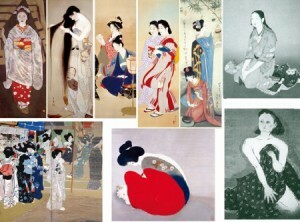 That is why a torii has crosspieces and is usually painted bright scarlet. Yet, we humans use it as a “gate” to a sanctuary. 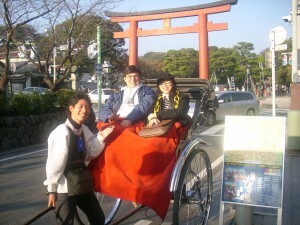 Anyway, we three got on rickshaws, one of which was for Tomoko-san and Dave-san,and the other of which was for me. The rickshaw-puller for the two friends was a versed guy who was good at speaking English, while the onefor me was a younger man who had been born and grown up in the neighborhood. And we departed from near the shrine entrance area in front of the Third Torii gate for our planned destination, Hasedera(/長谷寺) at about 3:30PM. We ordered a 30-minute tour with some stop-off points along the way up to Hasedera,which is located in Hase area that is a bit distant southward from the Tsurugaoka Hachimangu and Kamakura Station area. Pingback from One day in Kamakura with great NIGAOE artists (Part 3) | Tenkai-japan: Cool Japan Guide – Travel, Shopping, Fashion, J-pop, etc. 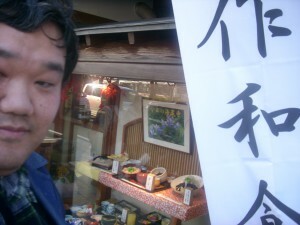 Pingback from One day in Kamakura with great NIGAOE artists (Part 4) | Tenkai-japan: Cool Japan Guide – Travel, Shopping, Fashion, J-pop, etc.